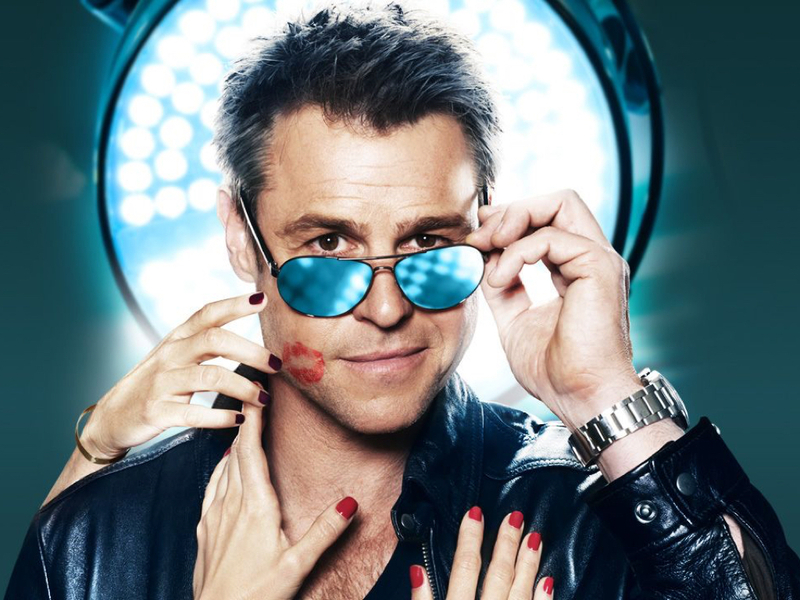 Rodger Corser plays a charismatic surgeon who falls from grace in "The Heart Guy" on Acorn TV. Rodger Corser may not be well known in the U.S., but viewers here probably have seen the busy Australian actor in at least one of his TV roles. Corser stars as Hugh Knight in “The Heart Guy,” a marvelous mix of family dramedy and medical procedural that chronicles a successful Sydney surgeon’s fall from grace and his hilarious efforts to revive his career. Hugh’s rehabilitation begins when he assigned to work as a general practitioner in the small town of Whyhope, which happens to be the hometown Hugh couldn’t wait to escape. All 10 Season 1 episodes of the series, titled “Doctor, Doctor” Down Under, currently are streaming on Acorn TV. The service launches Season 2 on Feb. 5 with the first two episodes. American viewers also may have watched Corser in two other current roles: as the mysterious John Doe in “Glitch” (Netflix) or as police Chief Superintendent Frank Carlyle in “The Doctor Blake Mysteries” (on PBS and Netflix). A quick menu search on Hulu, Amazon or other outlets and you likely will find his former shows “Rush,” “MacLeod’s Daughters,” “Underbelly” and maybe even “Camp,” the 2013 NBC series in which he starred with Rachel Griffiths. Corser apparently hasn’t stopped working since he walked into an audition for “Rent” in 1998 with nothing prepared, but still landed the leading role of Roger for a tour of the award-winning musical. I chatted with Corser as he was filming Season 2 of “The Heart Guy” on Bondi Beach in the Sydney suburb of Bondi. His character was supposed to be surfing, but the waves were not cooperating with production. Corser and I talked about Hugh’s journey, working with the fantastic cast that includes Ryan Johnson (“Fairly Legal”) and Nicole da Silva (“Wentworth”), what fans can expect in Season 2, and that “Rent” audition. Rodger Corser stars in “The Heart Guy,” which can be seen in the U.S. on Acorn TV. What are you up to today, or tomorrow I guess for me? We just started of our second week of filming for Series 2. It’s a rare day today because we’re on location and as I’m talking to you I’m looking out the trailer window at Bondi Beach. It’s not a bad office this morning. We open the season with me body surfing out in the waves, but we’ve picked the flattest day on record at Bondi. There’s not a wave in sight and it is quite cold because we’re heading into our winter. We were out there with the underwater camera waiting around for about an hour. I think there was one very small wave that we managed to catch. It’ll still look pretty, though. So Hugh must have gone back to Sydney despite that moment with Penny in Episode 10? Yeah, for a little bit. Without giving too much away, in Series 1 we learned about his artificial heart [invention]. There’s a little progress with that. … It’s good they’re picking up on [that detail], especially for people who binge the show. In the past, I think sometimes especially in Australian productions, they sort of go, “Oh that was in Episode 1; no one remembers that.” Now people watch it in a week, not week to week; you’ve got to be faithful to those bits of storyline. I’m glad we’re able to talk; I’ve seen your shows on streaming services. It’s all just a surprise. We never think that our shows make it over there, but I think it’s probably happening a bit more with streaming, isn’t it? You get a few more international shows, just because everyone needs content. I’ve actually watched you in several shows. You’re a busy guy. You hang around long enough, mate, and everyone else seems to get real jobs. There are only about four of us in the age bracket, so they’ve got to pick me one in every four jobs pretty much. I don’t think you ended up in “The Heart Guy” simply because your number came up. You and the entire cast are great. I’m enjoying it. Looking back to the beginning, what was it about Hugh that you found interesting enough to take on the role? It was his confidence. We had a pop song in the ’70s here called “Ego Is Not a Dirty Word” by a popular band in Australia called Skyhooks. I think it’s kind of his theme song. He’s cocky and he’s not afraid to be—which often is not an Australian way to be. People here sometimes try not to show themselves as better than anyone else. We’ve got a tall-poppy syndrome in Australia sometimes, but Hugh is kind of the opposite of that. He likes being a high achiever and he wants to be the smartest bloke in the room. He’s a confident, sort of charismatic guy. That’s a great setup for the show, because of course we’ll give him a monumental fall from grace and watch him try to come back and strive to do better. One of the big notes from the producers was other characters would go back to a small town and kind of sulk about it and say, “I think my life’s over.” But any situation Hugh is in, he tries to relish it. So even though he’d rather be back in the city, when he goes back to his small town and he wants to be—and thinks he should be—the biggest fish in this small pond. So there’s always a confidence to him no matter what. I think it’s a nice trait for that lead character to have, so he always has a positive edge. He is cynical, but if you think about it, he never becomes too sarcastic or too cynical. He just likes taking the [piss] out of the small town hicks. He sometimes does thoughtless or selfish things, but then he ends up redeeming himself in some way He realizes the mistakes he’s made. Yeah, we’ve always got to have him kind of two steps forward, one or two steps back, because we can’t have him learn all his lessons. He wouldn’t be fun then. He’s just a fun character, a high achiever, and he gets some good lines as well. That’s good for me. Do you think people with bravado like that are maybe hiding some insecurities? Well yeah. I mean the basis for him wanting to be a high-achiever has more to do with his dad. Hugh was a bit of a smarty-pants. At school he was probably top of his class and ultimately smarter than his dad. So his dad might have been slightly jealous of him. He was never going to pass the farm on to him because Hugh has a different skill set. So it was not like he could teach his son anything really. But he sort of forgot to be a dad and love his son along the way. Now there’s this animosity between them. I suppose Hugh is over-achieving to get praise from his father. He’s never wanted to show the cracks, I suppose, and especially to his dad. He wanted to prove that he was smarter than his dad and he was going to go off to the city and have this big-time city job. He’s not just going to be a doctor, but be the best doctor. He’s not going to be a GP, but be in a super-specialized field and at the top of that field. It was all really almost to stick it up dad, and say to him, “Look what I can do that you can’t.” It definitely comes from that place. A lot of family dynamics swirl about in the show. The dad is sort of the same way to Ryan’s character when he wants to expand the brewery to make the farm a success. Their dad pushes back. He’s getting to a point in his life where his offspring are overtaking him. They’re more productive and their ideas are different, but are probably smarter. … My parents are heading toward retirement now and I think it’s a relatable storyline for someone who’s in that age bracket, trying to still feel useful and like a contributor. The Knight family dinners are probably my favorite scenes. I think probably one of the most fun parts of the show is when the family all get around the dinner table. You get Tina [Bursill], who plays [Hugh’s mom] Meryl, in there and you get in there with the short, sharp one-liners to each other over the dinner table, it’s quite fun. Those scenes take ages to shoot, but the results are good. It feels like everybody’s just so perfectly cast; they’re so good. Yeah, they are. Steve Bisley [who plays Hugh’s dad, Jim] is a legend here. He was in the first Mad Max film with Mel [Gibson]; he’s had a big career. Tina has had a big career as well. No one else can play that straight-face comedy like she can. She’s perfect. You can see where Hugh gets his ambition, from his mother. Hugh has scenes with his parents, his brothers, his sister-in-law, nurse Aoife and his new boss Penny. Were you ever not filming? I had one day off last year. Yeah, one day off and that was a great day. I was pretty much under the pump. It was pretty much back-to-back scenes. … You need a break when you do eight scenes back-to-back and most of them have medical dialogue. We try to take as much of the jargon out, because I said I can’t go home and learn eight scenes and 50 unpronounceable names overnight. This [second series] it has definitely opened up. The reason Hugh is in everything in Series 1 is that we were taking the audience to Whyhope for the first time along with Hugh. We see everything and are introduced to all the characters through Hugh’s eyes. Because we’ve been introduced to all the characters now, they can sort of stand alone a bit more. And it means our first week of filming Series 2 I actually had a day off and other days I had just two scenes. That was a very different and very nice. We’re down at Bondi today. I’ve done one scene in the surf, and I’ve got about four scenes off; this is like a holiday. Several jokes in Series 1 have been aimed at Hugh’s age. How does that make you feel, Rodger? You look good; you don’t need to worry about all that. Tell me about working with these folks. We get a bit silly at the hospital. The family gets a bit silly, too. For the family scenes we get to travel. The hospital crew shoots on a set in Sydney. The Knight family homestead, we travel way down south on the outskirts of Sydney. So we stay down there because when you’re doing 13 hour days you don’t want to go back and forth. Most nights we all end up at the pub where we’re staying. We all kind of got to bond that way. When we go away to the small town, Mudgee, which is 3 1/2 hours by car or an hour plane ride, we spend 10 days. On the day off everyone goes out to the wineries there. So everyone got to hang out together, which is great because there’s sort of an accelerated bonding going on. When you’re having a few drinks with people, you always start to relax a bit. I think the results are on screen. But I’ve known Nicole [da Silva] for coming up to 10 years. I did 70 episodes of a procedural cop show called “Rush” with Nicole, so I was really good mates with her. And I knew Ryan as well. We’ve got the same agent so we already had sort of a head start. I’d worked with Bisso [Bisley] on a couple of episodes of “Water Rats,” which is another cop show. I hadn’t seen Bisso for a while when we started this, but Nicole and Ryan I already knew so it was pretty easy to just pick up on those friendships and run with it. Nicole da Silva (left), Ryan Johnson and Rodger Corser star in “The Heart Guy” on Acorn TV. Talk about the trio of Matt, Charlie and Hugh. That’s a very complicated relationship to pull off, isn’t it? If that actually happened in your family it would be totally freaking awkward, wouldn’t it? … I suppose when you think about it, you sort of would just avoid that family altogether. Hugh just got thrust back into a family dynamic he didn’t want anything to do with, because it is totally awkward. So we keep that kind of triangle going into the second series. It’s not like anything happens, but there’s a little bit of a jealousy, obviously, with Matt. It makes sense. You’d be constantly suspicious of your wife in that situation. It’s always just sort of the undercurrent. He’s joking, but slightly not joking. There is that part of Hugh that doesn’t like to lose anything. He doesn’t like to concede. I believe he thinks that because Charlie chose Matt, Hugh came in second best. Now he wants to still know that he could get her back if he wanted to. Well, I think that sort of happens at the start of this second series. He’s sort of had enough, and sort of puts his foot down a little bit. So let’s talk about; sort of give U.S. audiences a peek at your career. I read that you were in bands. That was my entrance into showbiz. Hugh didn’t sing Karaoke in the first season of “Heart Doctor.” Are we going to get to hear you sing in Season 2? I haven’t seen anything yet, but I’ve only seen the first four. So there could be a possibility; you never know. Maybe we could be jumping the shark when we do the musical episode. Maybe that’s a Series 3 thing. Back to your band days. I was in a band, then I tried out for a tour of the rock musical “Rent” over here. I got in the Australian cast of that just sort of off the street. It was very closely associated with the original Broadway team. Yes, Rodger played Roger. I sort of walked up with my guitar and pretty much presented them with the character not knowing the show at all. They thought it was hilarious because this guy walks in with a guitar and didn’t have anything planned for the scene. They said, “What are you going to play for us?” And I went, “I dunno.” They were kind of shocked. Everyone wants to get in this musical and you walk up like Mister Casual and go, “Well, what do you want to hear? I can sing you this one, I’ve got a cover, or an original, or what do you want to hear?” So it was all very casual, and because I was Rodger as well, I think they just thought it was meant to be. Then I got an agent. They started sending me some TV gigs and I sort of learned on the job. Unfortunately, me learning my trade is all kind of out there on the screen. You can see me making massive mistakes in my first five years of getting jobs. But I think you learn pretty quickly, because you look at your stuff and you sort of cringe. “Aw God, I’m not doing that very well!” You concentrate on that problem a little bit more next time. Mothers have asked me how their kids should get into the business. I say, “Well, never follow my path.” It was kind of unique just falling in to the lead role, and then trying to fill the gaps in, you know? It seems to have worked for you. I saw that you were nominated for, what is it, the Gold Logie? That what it’s called? Yeah, it’s actually like a People’s Choice Awards we have here, so it’s our kind of Emmys. There are industry voted parts and people’s choice parts. It’s sort of a popular personality thing, but I think it’s just because the show has been received so well, and they start to try to campaign for you. I think my mother learned how to change her VPN number on the computer and vote about 20,000 times. That probably helped. All right Mister Humble. Will you be back on “Doctor Blake Mysteries?” Will there even be more Doctor Blake? I think they’re trying to find a new home for it. They’ve still got one in the can—Series 5, which I wasn’t in. So they’ll play that during the year here, so that’ll come out internationally after it plays here first and then I think the ABC wanted to say goodbye to it with a telemovie. I think they wanted to wrap up the love story and maybe put a happy ending on it. But I think the producers have other ideas and kind of want to shop it around and take it to another network and give it a longer life. LOVE LIVE LOVE THE HEART GUY- THE ENTIRE CAST AND CREW. AM EXILLERATED THAT ITS FILMING SEASON 2. NOW IT WOULD BE ABSOLUTELY THRILLING IF ” OFFSPRING” WOULD AIR SEASON 7 IN THE USA TOO! FROM A GROWING AMERICAN AUDIENCE WHO THINK THE AUSSIE WAY IS THE ONLY WAY !! I love Australian television shows and movies. They are top notch. The acting is always superb. The writing is brilliant. We see a lot of it here in Ireland. I love it. The heart guy is so good, I cannot wait for more.